After one night away from the winner’s circle, the Liberal Bee Jays jumped right back in it Saturday night. 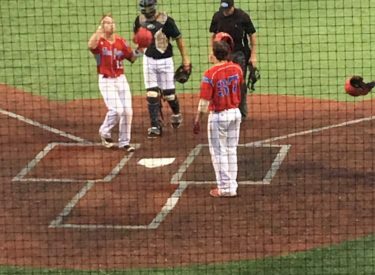 The BJ’s beat El Dorado 11-1 Saturday night at McDonald Stadium in El Dorado. Bee Jay pitching struck out 19 Bronco hitters in a dominating performance. Sam Beattie pitched seven dominant innings with 14 strikeouts and two walks. He allowed two hits. His only mistake was hanging a pitch to El Dorado lead off batter Jaret Koin who homered in he first. Chance Carner struck out the side in the eighth and Caleb award struck out two in the ninth. The Broncos took the lead with the first inning homer. Liberal scored three in the fourth. They loaded the bases with one out and Jaron Robinson singled to center to tie the game. A Kyle Schmidt grounder to third resulted in an error allowing two runs to score. Liberal scored two in the fifth on a Zac Cook sac fly and newcomer Marcus Shiemaker scored on a wild pitch after he had singled. Chad Kennedy singled to lead off the seventh and later scored on a Cale O’Donnell ground out for a 6-1 lead. Kennedy blasted a ball over the left field fence in the eighth for a three run homer and his second of the season. The BJ’s scored two more in the ninth as Trent Maloney and Schmidt doubled. After two hits the night before, the Bee Jay bats were back with 11 runs and 11 hits. Liberal has won 12 of their last 13 and is on top of the Jayhawk League at 14-4. El Dorado is 8-11. Derby beat Hays 5-4 so Hays is 11-5 and Derby is 12-6. Liberal plays one more game at El Dorado Sunday night at 7 with the Dugout Show at 6:45 on 1270 and kscbnews.net.